and Highway 638. There is designated parking at this entrance. any of the fenced in areas along the trails. The ‘Main Trail’ follows a former railway spur that at one time ran between Taylor and Moffat Mines. This spur was part of the old Nip and Tuck railway system that operated in the Bruce Mines and Plummer Additional area during the 1860’s. Evidence of the old spur can be seen at the Moffat Mine entrance where some of the original rail-way ties are still in place. The trail system is surrounded by an assortment of magnificent coniferous and deciduous trees. The red gravel that makes up a large portion of the trail is copper tailings. All the mines along the trail were owned by the Montreal Mining Company. This is where the mine trail begins. The Taylor Mine is the fenced in area by the entrance to the Mine Trail off Highway 17 and is the first mine that you will see. The first sub-trail is the ‘Jail Trail’. This trail is located on the west side of the main route and is approximately 100 metres in length. It is of moderate difficulty. The shadowed and winding trail leads to the scene of some of the Town’s more colourful history. During the 1870’s, the need for a jail in the area became clear as profitable mining operations were leading to a quickly expanding population. The trail comes to a stop at the actual jailhouse, which still stands as a tribute to the characters and controversies of a newly-burgeoning town. The jail was shut down after the Bruce Mines were shut down. Since that time the building has been used as a Scout Hall and schoolroom. It is now under the care of Bruce Mines & District Historical Society. The second sub-trail is the ‘Michael Mine Trail’ located on the east side of the ‘Main Trail’ and leads you to the Michael Mine. A large collection of quartz and other unique rocks can be seen here. The Michael Mine Trail is a wide and sun speckled path, 200 metres in length and has a low level of difficulty. The third sub-trail is the ‘Montreal Mine Trail’ located on the east side of the ‘Main Trail’, just beyond an abandoned vehicle left to be claimed by the forest. The entrance is marked by a fallen pine. The trail is 300 metres in length, of moderate difficulty, and leads back to a craggy expanse of boulders, bed rock, and forgotten mining infrastructure. The ‘Bruce Section’ of mines located on the west side of Taylor Street is the Ferrier Mine at a depth of 66 metres and the Meredith Mine. The mines located on the east side of Taylor Street are the Engine Mine at a depth of 46 metres as well as the Rankin/Scott, Prideaux, Harris, Davis, and Trial Mines. Designated parking space is on the east side of Taylor Street. The fourth sub-trail is the ‘Moffat Mine Trail’. It is 200 metres in length and is of moderate difficulty. This trail leads you back to the Moffat Mine. It is located just across from the trail’s first peek at Lake Huron. 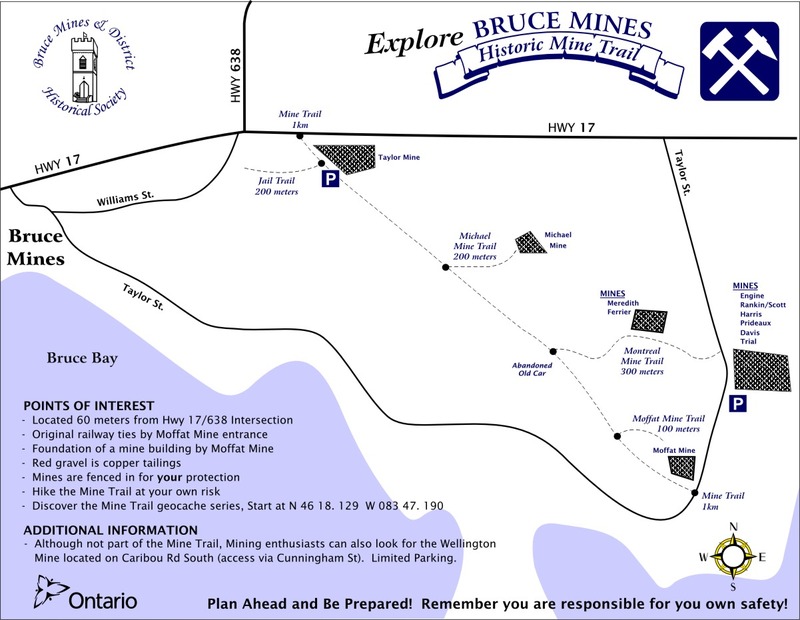 Once you reach the Moffat Mine, keep an eye out for foundation remnants and other hard evidence of Bruce Mines’ industrial past. This trail is slightly more difficult than the others, though the glittering view of Lake Huron is well worth the hike.